A creamy bowl of potato soup is one of my favorite comfort foods. When making potato soup, the variety of potato used is really up to you. I like to use small red new potatoes. Yukon golds and even Russets also make a great base for potato soup. Frozen Southern-style diced hash brown potatoes can even be used as a short cut. No need to peel or dice those frozen potatoes – just pour them straight into the soup pot from the bag. Since potato soup has just a few ingredients, a lot of the flavor comes from onions. Use yellow onions because they add a sweeter, more mild flavor than white or red onions. I sauté mine in butter for that buttery flavor. But if you are a bacon lover, try sautéing the onion in bacon drippings. When cooking the potatoes, it is important not to overcook or undercook them. When perfectly done, the tip of a paring knife should go through the potatoes easily. For that velvety creamy texture that makes the perfect potato soup, heavy whipping cream is definitely a key ingredient. Whether you use a few tablespoons or a few cups, cream gives soup a silky mouth-feel and rich flavor. You can substitute milk, though it will taste gradually less creamy as you go down in milk fat percent. To get the soup creamy, simply blend in a blender or food processor. Using an immersion blender works as well. If the soup is too thick, you can thin it by adding a little more chicken stock or milk. 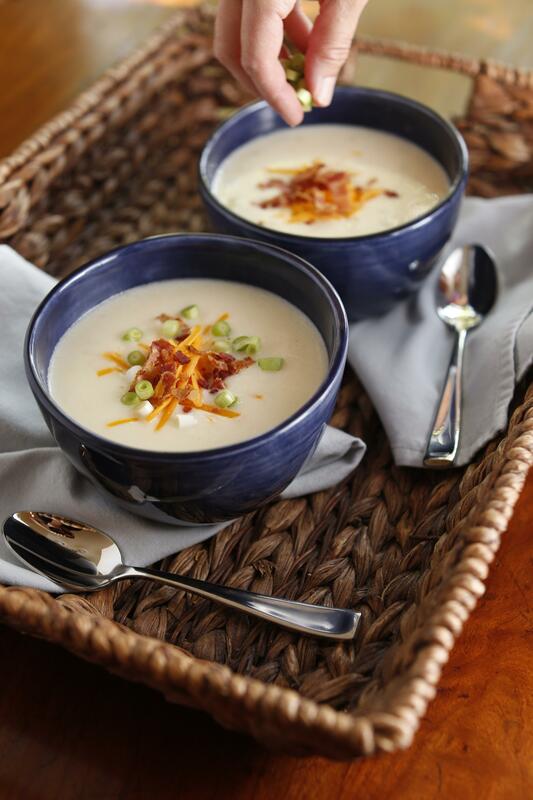 Garnish your potato soup just like you would baked potatoes – loaded with crispy bacon, shredded cheese, and scallions. This is Jennifer Chandler with The Weekly Dish! Bon Appetit! In a large Dutch oven or stockpot over medium-high heat, melt the butter. Add the onion and cook until soft, about 5 minutes. Add the potatoes and stock. Bring the mixture to a boil over high heat. Lower the temperature to medium and simmer uncovered until the potatoes are tender, about 10 minutes. Stir in the heavy cream and cook for 5 more minutes. Place half the soup in a blender or food processor and puree until smooth. Add the pureed soup back to the pot and stir to combine. Season with salt and pepper to taste. Serve warm, garnished with crumbled bacon, cheese, and scallions, if desired. Printed with permission from The Southern Pantry Cookbook by Jennifer Chandler.